My inside propane gage (LEDs light up to show fuel level) has read 100% for the 11 months I've owned this RV. I've occasionally checked the outside on-the-tank gage to get an actual idea of true fuel level. Today, I checked it and happened to jossel the wires a bit and one wire just came loose from the gage! It's the raw wire end shown on the right in the picture. I've tried to pry open the little plastic part where the wire use to attach and can't seem to open it. Can't see up in there either. Just tried to see if I could grab the end of a terminal with my needle nose but can't. So I'd like to remove the gage to work on it...or to replace it. But I don't know how. Never have read any posting about 'how' to remove one of these on tank gages. Will gas or liquid flood out? 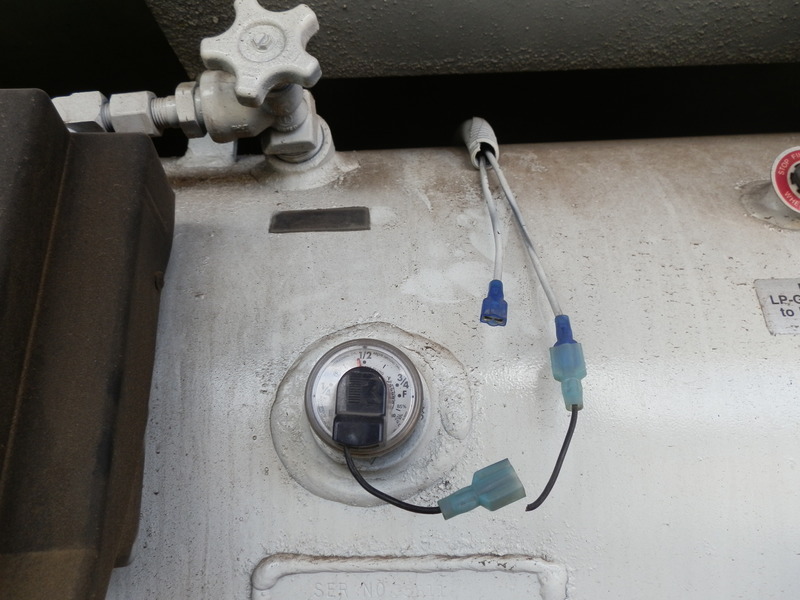 Is the tank suppose to be empty before removing the gage? Make sure the tank is COMPLETELY empty before you do anything other than use it. Why try to shorten an already short life? Tank REALLY should be empty if you remove the sender!! Best to take it to a propane shop if you are not used to working with propane. Providing the tank was empty, and you change the valve yourself, it will need to be vacuumed down to be sure there is no moist air remaining before it's refilled. Please be careful, and far away from any possible open flame or source of spark. NO trouble lights, power tools, extension cords, etc. Also be aware of static electricity spark- ground everything! Good Luck, and I suggest take it to a professional. I suspect it's the ground wire that's broken. Try to hook up the remaining wire and touch the broken wire to ground while someone watches the display LED's. Maybe you can just pick up a ground someplace else. Jim_HiTek The plastic part of the propane tank sender unit is either a snap on or a screw on. You do not put the float unit to replace the sender. Here is a link to a snap on type. Could not tell which one yours is and Winnebago uses both types. As mentioned above, the plastic part is a snap in thing. Behind it, inside the tank, is a magnet that turns as the level goes up or down. The outside needle reacts to that. Unless you use a BIG socket and long breaker bar, your not going to compromise the tank and create a leak. Why can't you just splice the wires back together again? Seems like a simple fix to me. It looks like the wire end goes into the little black box. If the little black box unscrews or snaps off the question is whether or not you can open it to get to where the wire was supposed to be connected too. If you can then I would solder it back on. YMMV. Otherwise it seems to be a simple replacement. I'd take the sender off and look it over. Worst case buy a new one, best case solder the wire and back in business. The wire is broken off inside. also even if one replaced the actual mechanical part that drives the electric sending unit you do not have vacuum down at all. He mentioned he was going to remove the gauge. Not the plastic sensor. OK, just didn't want to read about him in the paper! Twinboat has it nailed. I don't think you have anything to lose other than time by shaving back the black plastic on the lower right part where the wire came out to see if you can expose the spot where the wire was terminated or the wire broke, then re-connecting it. If you use heat to soften the black plastic be sure to shield the clear plastic. I would not replace the sender before doing this. Also I suspect a generic replacement sender won't have the cool manual read gauge that they used back in '02 , and you may have trouble finding the exact replacement . Good luck.